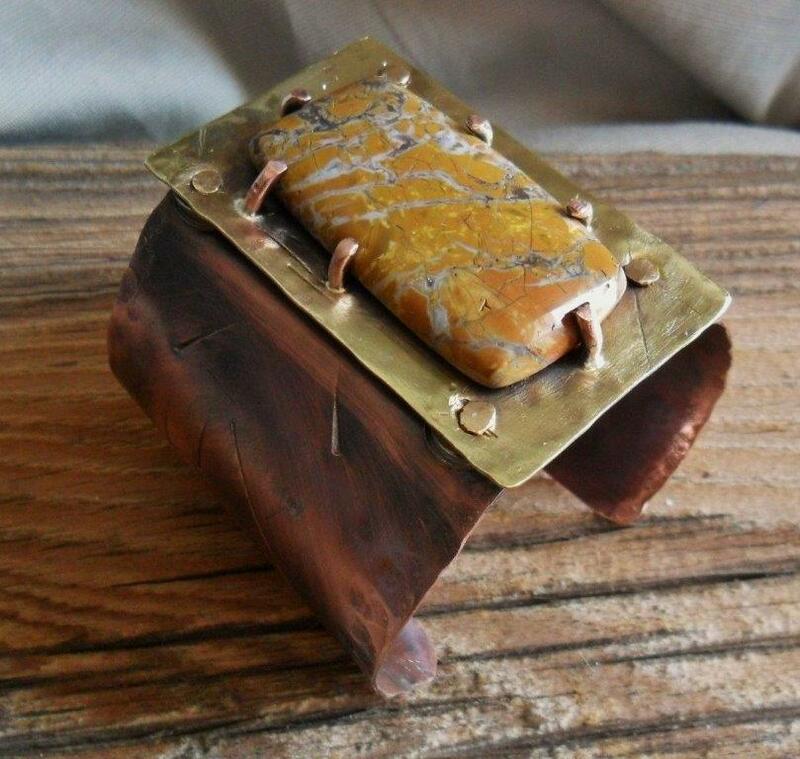 Let Cheryl guide you though creating your own, unique copper bracelet with brass and silver embellishments. A semi-precious stone will be bezel or tab set and riveted to the bracelet. You will learn and practice piercing, sawing, roller printing texture, filing, bezel and tab setting. We will also play with silver sulphur patination. Each student will complete one intricate bracelet with a set stone. We will take a break from instruction for lunch. You are welcome to bring your own lunch and remain in the studio or visit one of the many fantastic dining options in Downtown Courtenay. All supplies and use tools are included. That means you just show up! We have aprons, but wear clothes that can withstand the elements (i.e. glue, paint, etc.) of a fun, creative art studio. Nothing else is required. Bringing your own beach glass or beach stones is optional. Cheryl Jacobs Designs is located in Cumberland, BC where Cheryl produces jewellery for stores and galleries across Canada and the US. Her distinct style of silver jewellery includes earrings, bracelets, and pendants. Cheryl Jacobs is also recognized for her custom jewelry in gold or silver. She has recently introduced her newest line of symbolic devotional jewelry which includes lotus flower earrings and Buddha pendants.